Jenvey has announced the TP11 Throttle Position Sensor based on the successful motorsport items produced by Variohm. 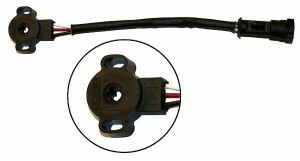 This excellent design features a potentiometer with multiple fingered wipers to ensure good contact, even under severe vibration. A conductive plastic track provides durability and extended life expectancy. The sensor has excellent temperature co-efficiency making for more stable readings at all positions. The sensor is sealed to a minimum of IP65 specifications. Despite these superb features the TP11 retails at just £68 inc VAT with more information available via www.jenvey.co.uk or at the other end of 01746 768 810 ENDS. Print article This entry was posted by admin on February 28, 2013 at 6:33 pm, and is filed under News. Follow any responses to this post through RSS 2.0. Both comments and pings are currently closed.